BETHLEHEM — The Community Garden at the Swenson Farm Preserve is in full summer flower, providing a bounty of fresh produce for neighbors in need. Cucumbers and tomatoes, peppers and pole beans, eggplant and squash, broccoli, cabbages and kale are among the vegetables harvested so far this season. Measuring approximately 120 feet by 80 feet, the garden is divided into 10x20-foot plots, eight of which are rented to Bethlehem residents. “At least half is for community service,” said Nancy Stein, who manages the garden with Sandy Ruzicka. Produce from the garden goes to the Bethlehem Food Bank, the North Purchase Senior Center and low income families. A home care nurse takes food to those who are home-bound. A team of dedicated volunteers helps with the planting, weeding, harvesting and other maintenance chores. Nonnewaug High School Vo-Ag student Erin O’Connor of Woodbury is serving an internship in the garden this summer. Erin visits the garden two to three times a week to water and weed, plant crops and harvest them. One day recently, the garden received a welcome gift of labor from nine young men, ages 13 to 17, from the Wilderness School, a summer program of the state Department of Children and Families. Based in East Hartland, the Wilderness School was founded in 1974 as an alternative program for Connecticut adolescents. Over the past 39 years, more than 4,200 students have participated in its rigorous multi-week Expedition Programs; many more have attended a Wilderness School Short Course. Operating in partnership with more than 150 community referring agencies, the Wilderness School offers prevention, intervention and transition programs for Connecticut adolescents. Students choose to participate and commit to the program; those who do are presented with physical and emotional challenges in a supportive setting that offers opportunities for growth and learning and the rewards of goals achieved. Wilderness School Course Director Nicky Wood accompanied the young volunteers on their day in Bethlehem. “These kids are on a 20-day expedition,” she said. “They’ve been hiking with backpacks, they’ve been camping every night, sleeping under tarps they rig themselves and cooking their own food on stoves they carry with them. About two weeks into their expedition, the boys were spending about four hours that day at the community garden, performing some heavy maintenance tasks for the garden manager under the direction of three instructors. Working together, they cleaned out a section of ground next to a creek, laid down landscaping fabric, shoveled wood chips and moved in picnic tables to create a shaded rest area for those who come to work in the garden or hike the Swenson Farm Preserve. After a break, they worked the ground to create beds for winter squash, the last crop to be planted this year, then cleared dense overgrowth from a corner of the garden that can now be used as a composting area. “This is their day of service, of giving back to the community,” Nicky told Voices. “It’s also a fun day, a little relaxed, different from what they’ve been doing. They have a chance to interact with people around them. “Coming up next they’ll have a 36-hour solo expedition. Then they do their ‘final expedition,’ a three-day backpacking trip where the instructors take a step back from their roles and allow the students to take over their course. Nancy Stein was clearly grateful for the concentrated manpower on a hot summer day. 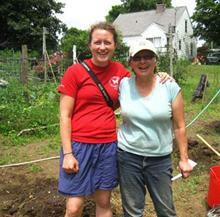 This is the fourth year for the community garden and the first year that Nancy and Sandy have been co-garden managers. The Swenson Farm Preserve Community Garden is located on Route 132, Kasson Road. Volunteer gardeners are welcome. Those seeking additional information may visit the Bethlehem Food Bank at Town Hall on Main Street, or leave a message for Nancy Stein at 203-266-7084. Additional information about the Wilderness School can be had by calling 1-860-753-8059.